NOTES: 1997 boxing, includes photo etch and metal parts. The D.V entered service in May 1917 and structural failures of the lower wing immediately occurred. In 2009, Guttman wrote that "Within the month Idflieg was doing belated stress testing and concluding, to its dismay, that the D V’s sesquiplane wing layout was even more vulnerable than that of its predecessor". The outboard sections of the D.V upper wing also suffered failures, requiring additional wire bracing, and the fuselage sometimes cracked during rough landings. Against these problems, the D.V offered very little improvement in performance. Front line pilots were considerably dismayed and many preferred the older D.III; Manfred von Richthofen was particularly critical of the new aircraft. In a July 1917 letter, he described the D.V as "so obsolete and so ridiculously inferior to the English that one can't do anything with this aircraft". British tests of a captured D.V revealed that the aircraft was slow to maneuver, heavy on the controls and tiring to fly. 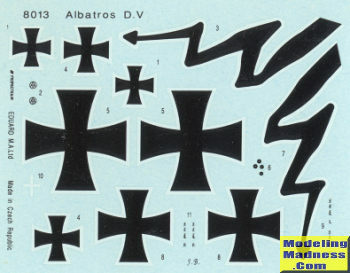 Albatros responded with the D.Va, which featured stronger wing spars, heavier wing ribs and a reinforced fuselage. The modified D.Va was 23 kg (51 lb) heavier than the D.III but the structural problems were not entirely cured. Use of the high-compression 130 kW (180 hp) Mercedes D.IIIaü engine offset the increased weight of the D.Va. The D.Va also reverted to the D.III aileron cable linkage, running outwards through the lower wing, then upwards to the ailerons to provide a more positive control response. The wings of the D.III and D.Va were interchangeable. To further strengthen the wing, the D.Va added a small diagonal brace connecting the forward interplane strut to the leading edge of the lower wing; the brace was also retrofitted to some D.Vs. Idflieg placed orders for 262 D.Va aircraft in August 1917, followed by orders for another 250 in September and 550 in October. Ostdeutsche Albatros Werke, which had been engaged in production of the D.III, received orders for 600 D.Va aircraft in October. Deliveries of the D.Va commenced in October 1917. The structural problems of the Fokker Dr.I and the mediocre performance of the Pfalz D.III left the Luftstreitkräfte with no alternative to the D.Va until the Fokker D.VII entered service in mid-1918. Production of the D.Va ceased in April 1918. In May 1918, 131 D.V and 928 D.Va aircraft were in service on the Western Front; the numbers declined as the Fokker D.VII and other types replaced the Albatros in the final months of the war. By 31 August, fewer than 400 Albatros fighters of all types remained at the front but they continued in service until the Armistice. Eduard basically got its start by doing WWI era planes and the Albatros D.V was one of those that put the company on the map. Prior to this, not much was done in terms of WWI model kits, but Eduard made a good choice and these were well received. There is no doubt that these are short run kits. The plastic itself has very light engraving and is quite shiny. Ejector pin marks are on several pieces and most of the small stuff is relegated to photo etch. In addition, the engine and engine parts are in cast metal. 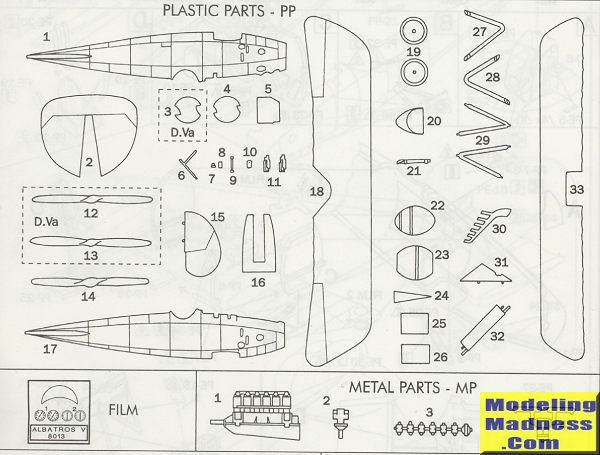 Two sprues consist of the major airframe parts, wheels, wings and props as well as a seat. There are plastic bits for the landing gear legs as well as the wing struts. Cockpit floor, bulkheads and seat are also plastic as are the the breeches on the machine guns. An acetate sheet is provided for the windscreen and instrument dials. 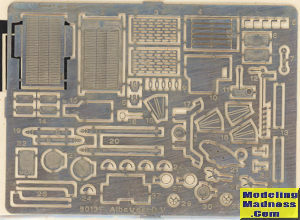 The rest of the parts, including cockpit details, gun details, cabane struts, radiators, control surface control arms and so on are photo etch. The p.e. image does not show the second smaller fret. The kit offers several different props and two different spinners depending on if you do the D.V or D.Va. On my kit the head rest fairing was missing, but photos show that not all planes had this feature and one of the markings options is without it. A new one can easily be made from something like an F-104 fuel tank from the spares box. Instructions are well done and offer well drawn steps as well as generic painting information and a rigging diagram. A full color painting guide is provided with one being the box art plane of von Hipple and the other being a black fuselage plane of Herman Goering. The decal sheet is nicely printed and many aftermarket sheets have been produced for this aircraft. The red pinstripes around the tail section will need to be painted (carefully). This kit shows just how far Eduard has come over the last 20 years. These were hugely popular and perhaps Eduard might want to consider doing modern toolings of this and other subjects. As you know, modeling goes in phases and perhaps the WWI phase (like the Luft 46 phase) has run its course enough to not justify the effort. In any regard, these kits are not difficult to find and still make into nice models.